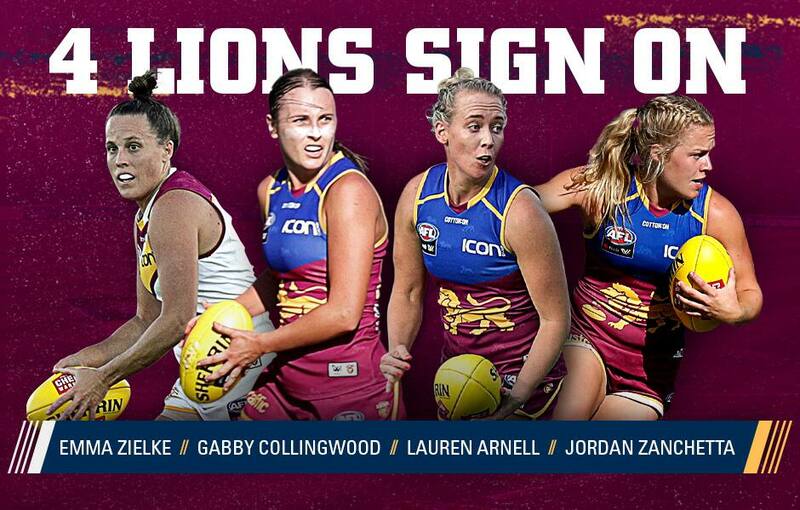 Vice-Captain Emma Zielke, Lauren Arnell, Jordan Zanchetta and Gabby Collingwood will play for the Lions in 2020, after all re-committed to the Club. Lions Women’s CEO Breeanna Brock said she was thrilled to have them back on board for another season. “We always knew the expansion period was going to be challenging for our Club,” she said. “That’s why we are so pleased to announce our next four signings this afternoon. Zielke was the Club’s inaugural Captain in 2017 and has played all possible games for the Lions. 2020 will be Arnell’s second season with the Lions after the veteran moved north. Arnell played all seven games this year and provide great on-field leadership. Zanchetta was the Lions first pick at the 2017 AFLW Draft. The midfielder has played 11 games across two seasons. Collingwood has been with the Lions for the past two seasons and is a Hyundai Help for Kids Academy graduate.